The Yorkshire Dales National Park includes The Howgills Fells, The Northern Dales and The Southern Dales areas of The Yorkshire Dales National Park. Designated in 1954, The Yorkshire Dales National Park covers an area 2,178 km² (841 sq mi) mostly in the county of North Yorkshire but with small areas in Cumbria and Lancashire. The Yorkshire Dales National Park is home to England's highest above-ground unbroken waterfall - Hardraw Force and the largest underground chamber naturally open to the surface - Gaping Gill. 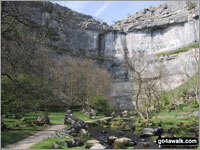 In the southern part of the park is Malham Cove, an 80m (262 ft) high x 300m (984 ft) wide limestone cliff 1km (0.6 mi). Close by is Gordale Scar, a dramatic 100m (328 ft) limestone ravine with overhanging cliffs. Further north is the Settle and Carlisle Railway. Built in the 1870s it crosses the more remote and scenic areas of the Yorkshire Dales including the famous Ribblehead Viaduct. Places to go walking from include: Aysgarth Falls, Bolton Abbey, Chapel-le-Dale, Clapham, Gargrave, Grassington, Hawes, Horton-in-Ribblesdale, Ingleton, Keld, Kirkby Lonsdale, Kirkby Stephen, Malham, Orton, Reeth, Sedbergh, Settle, Skipton and Thwaite. There are 119 classified Mountains, Fells, Peak, Tops and Hills that lie within the boundary of The Yorkshire Dales National Park National Park. All are within the capabilities of an averagely fit walker, hiker or rambler. To make your peak bagging records easier to manage, we have divided The Yorkshire Dales National Park into three distinct areas which are listed below. If you want to see all 119 classified Mountains, Fells, Peak, Tops and Hills in one go see The Whole of The Yorkshire Dales National Park but please bear in mind that the page may take a few extra seconds to load due to the amount of data being downloaded. 30 tops including The Calf, Calders, Yarlside . . .
26 tops including Great Shunner Fell, Wild Boar Fell . . .
63 tops including Whernside, Ingleborough, Pen-y-ghent . . .
119 tops including Howgill Fells, Northern Dales, Southern Dales . . .